Watson emerged the Jeopardy Champion last night with a resounding $ 77,147, beating both competitors (Ken Jennings:$ 24,000 and Brad Rutter:$21,600) by over 300% ($53,147/$55,547). 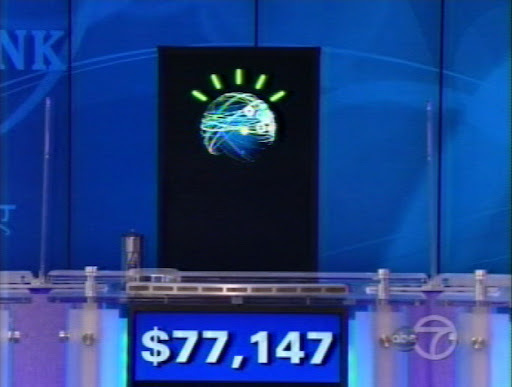 Natural Language Reality Check: The reality is that the technology that Watson demonstrates, while amazing in a game show, is overkill for what most people need. Those behind “natural language” search technologies have long trotted out sentences like the “Who’s in the pajamas” example above to demonstrate how “smart” their search tools are. And yet, most searches people do on search engines are only two or three words long. It is this challenge of data that clinicians face every day as they attempt to deliver the best possible care to each and every patient at the time of the consultation and something their patients expect. Definitely not overkill for patients or doctors and given the Tsunami of medical knowledge and the challenge of sharing clinical data. DeepQA will add a new level of medical intelligence to support to clinicians is with the application of Natural Language Processing taken to a new level of understanding. “Certified” is the $44,000 buzzword prefixing electronic health records (EHR) software. To qualify for Health Information Technology for Economic and Clincal Health (HITECH) Act incentive payments, you must use an EHR that is certified by the government. Additionally, you must use a system – or systems – that offer 100% of the functional and security capabilities required to meet “Meaningful Use” criteria. ● Certification Commission for Health Information Technology (CCHIT) – CCHIT began certifying EHR software in 2006. Since then they have released 10 certification programs for ambulatory and inpatient EHRs. ● KLAS – KLAS is a private organization that has gathered ratings on EHRs since 1997. Every year they rank EHR vendors and bestow a “Best in KLAS” award on the top 20. In an effort to stand out from the other 300+ EHR systems on the market, vendors widely promote their CCHIT or KLAS credentials. They may even tack the word “certified” onto their CCHIT or KLAS approved product. This muddies the water for providers. They have to distinguish between CCHIT, KLAS and certification from an ONC-Authorized Testing and Certification Body (ONC-ATCB). While CCHIT and KLAS are meaningful credentials, they’re not the certifications that qualify for incentive funds. This is especially confusing because CCHIT is now one of six organizations approved to certify EHRs for the HITECH Act. So, if an EHR vendor claims they have CCHIT certification, you’ll need to clarify which one. Is it ONC-ATCB certification, or one of CCHIT’s independent credentials? Software vendors can receive ONC-ATCB certification for a complete EHR or an EHR module. This means a product doesn’t need to meet all criteria for Meaningful Use – instead, it can be partially certified if one or more functions meet a subset of requirements. For example, a vendor could certify their e-prescribing application or their patient portal. This under-publicized detail could cost you thousands of dollars; by itself, a certified EHR module won’t make you eligible for incentive payments. You must use two or more modular EHRs that, combined, meet 100% of the ONC criteria. So while vendors can officially promote a module as having ONC-ATCB certification, it may fall short of making you eligible. Be mindful of guaranteed incentive payments. It is reasonable for a vendor to guarantee they’ll meet certification criteria. In fact, you might make it a requirement in your purchase decision. However, guaranteeing incentive payments is altogether different. Technology alone won’t make you eligible. EHRs are just a means to an end. Ultimately, you are responsible for achieving Meaningful Use status. So be wary of this type of guarantee. Read the fine print and find out how you are reimbursed if you don’t qualify for incentive payments. Does the vendor reimburse you the full amount of lost incentive payments? Or do you just get reimbursed for the cost of the software? You shouldn’t purchase a system based on this guarantee alone. To help you avoid thse pitfalls, we put together a list of 5 questions to ask vendors. Answering these will put you in a good position to become eligible for incentive payments. 1. Which certification does the EHR have: CCHIT, KLAS or ONC-ATCB? You must use an EHR that is ONC-ATCB certified in order to be eligible for incentive payments. 2. Which product version has been certified? Ask the vendor for complete details of their ONC-ATCB 2011/2012 certification, including: product name and version, date certified, unique product identification number, the criteria for which they are certified, and the clinical quality measures for which they were tested. 3. Does the vendor have certification for a complete EHR or an EHR module? If module, you will need to use more than one to be eligible for incentive payments. The ONC has created a handy website that allows you to build a list of EHR modules that meet 100% of ONC criteria. 4. Will the vendor resubmit their EHR for final certification in 2012? The current certification is temporary and only lasts through 2011. Make sure your vendor has plans to reapply in 2012, and find out if they will certify a complete EHR or just a module. 5. Are you purchasing through a reseller or other business partner that renamed the product? If so, make sure the renamed product has been approved by the ONC-ATCB. Even if it is the same version with identical features and functionality, it won’t make their Certified HIT Products List unless the original vendor reports it to an ONC-ATCB. This article was written by Houston Neal of Software Advice. To view the original article, visit Playing Games with ONC Certification. The recent publication of the PCAST Health Information Technology Report: Realizing the Full Potential of Health Information Technology to Improve Healthcare for Americans: The Path Forward, published December 8, 2010 (press release and covered in this webcast) and became something of a Piñata for comments. Vince Kuratis did a great job of pulling these comments and responses together in his his blog PCAST HIT Report Becomes a Political Piñata. from 20,000 to 100,000 (data elements) but a number of physicians seem to agree that a very useful collection of molecules and radicals would contain many fewer than 20,000. Stan’s presentation describes several different parallel efforts to enumerate the molecules using siloed methodologies. The one he is working on as identified more than 4,000. He points to several related posts – this from John Halamka: Detailed Clinical Models that points to multiple other standards in development in other countries (Open EHR in Australia, ISO13972, Tolven’s Open Source Clinical Data Definitions and the National Health Service Logical Record Architecture) which all adds up to a pressing need for a Universal Exchange Language…and in my mind translates to a significant challenge in developing and then keeping up to date. One thing is for sure – this is a complex issue requiring much attention and focus since the coordination and sharing of data is a fundamental building block of effective, efficient and safe healthcare. Effective sharing of data appears to require standards and exchange languages. But today is the first of three part episodes of Jeopardy featuring Watson . I talked about this back in June and again in December. Tonight is the first night of the Waston Jeopardy challenge. It is clear IBM has pushed the limits of computing technology and “understand” the complex human language which Nuance has partnered to bring this same technology to Healthcare: Clinical Documentation Challenges that will apply a whole new way of looking at clinical documentation that reduces our dependance on codes, structure and defined clinical data models. If we consider the adeptness of the human mind and our ability to understand the fine nuance detailed of clinical reports without the data being tagged or encoded this suggests that the Watson applied to healthcare concept may hold a critical key to exchange and intelligent use of data. Based on the existing standard of “documents” we can innovate and use these documents that are currently a natural part of clinical care. Dr Paul Offit MD (head of pediatrics at Children’s Hospital of Philadelphia): Deadly Choices: How the Anti-Vaccine Movement Threatens Us All which will no doubt draw fire form the anti vaccine crowd as his previous books did. He has written widely and has several oped (listed here) all of which debunk the myths associated with vaccines in an attempt to stem the rising anti-vaccine tide.